With three hours and 47 minutes left in the race, the last of the fastest LMP1 cars that hadn’t retired or had a major mechanical failure has come to a halt on track. The No. 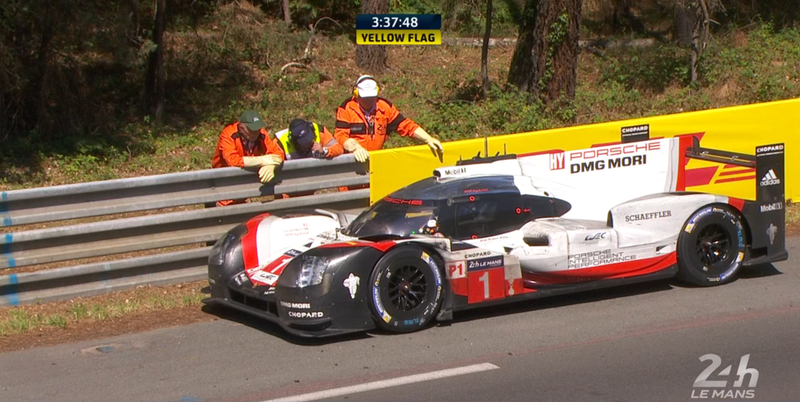 1 Porsche 919 suddenly slowed with no oil pressure with André Lotterer behind the wheel. Lotterer had a 13-lap lead over the entire field at the time of the failure. Lotterer’s car failed at Tête Rouge, at which point his team told him to switch off his failing internal combustion engine and try to limp home on electric power only. With no oil pressure, there is no oil and that engine wouldn’t have lasted. 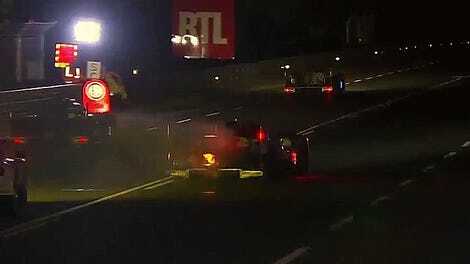 Lotterer came to a halt shortly after starting to limp the car home, but managed to get it restarted. Much like the Toyotas that were forced to limp in, Lotterer was instructed to only use the throttle pedal when necessary, and to try pressing it and coasting as much as he can. When Lotterer reached a slight incline, his car came to a stop again. He is now frantically trying to restart the car as the slower, LMP2-class No. 38 Jackie Chan DC Racing car eats away at his lead. If Lotterer cannot make it back in—with 60 percent of the 8.47-mile track left, making it unlikely—Porsche still has a chance to keep the lead. Marshals pushed Lotterer’s car forward some in order to move it to a safer turn-out next to the track. But it’s looking increasingly likely that Porsche’s No. 2 car—which sits in fifth place overall 12 laps down from the leader—is the LMP1 class’s best shot at actually making it on the podium for this race. UPDATE [5:34 a.m. ET]: Lotterer has given up on restarting the car. The No. 1 has now retired.